Is there a way to display only cell names and their boundaries in a design like the attached picture? Sometimes, I don't want to see the details but just want to know where the cells are located in a layout. Wednesday 10th April 2019 Thanks! By selecting only "show name", I can see the boundaries and cell names. However, I can only see the top cells, not the nested cells inside a cell. The "depth" option doesn't seem to change anything. For example, cell-1, cell-2, and cell-3 are the top cells in my layout. My cell-4 is inside cell-2. 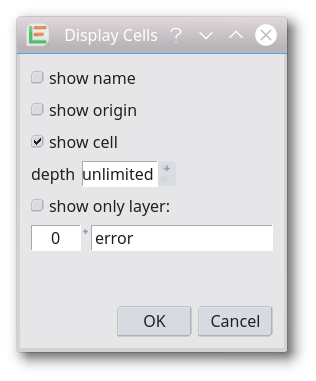 Cell-4 doesn't appear no matter what value is set for "depth". Any suggestion? Wednesday 10th April 2019 I am sorry. Nested cells can only be view, if the cell shapes are displayed as well.